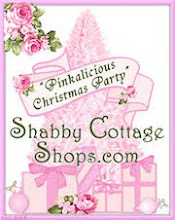 Shabby Cottage Shops: "Sweet Treats" Valentine's Day Giveaway at Shabby Cottage Shops has started! "Sweet Treats" Valentine's Day Giveaway at Shabby Cottage Shops has started! 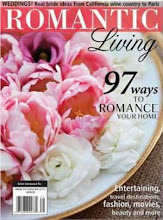 We're celebrating Love and Romance at Shabby Cottage Shops with a "Sweet Treats" Blog Giveaway! Ours "Sweet Treats" Giveaway is valued at $350.00! Our Valentine's Day Giveaway has started! Watch the Slide Show or view the pictures below to see what our shops have gifted for this very special giveaway, including $130.00 in Gift certificates to use at your favorite participating shop! Easy to participate, leave your comment at the end of the post! Our "Sweet Treats" giveaway will end January 30th, at 12 Midnight, EST. The lucky winner will be announced on February 1st at noon EST. So make sure to check back then! Participating shops are listed below! What a lovely piece this is - pretty pink roses grace the front of this metal wall pocket. The color is a delicate shell or blush pink accented with a bit of gold for elegance - so pretty and romantic! Perfect for your shabby chic, romantic, cottage, Victorian, or rose decor. What a lovely addition this romantic Shabby Cottage Floral Pillow would make to any home. This handmade pillow has lovely flower rings and 3 buttons on front and a pretty floral pattern with lace on back. Note the beautiful detail and trim. 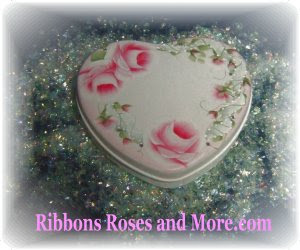 Pillow is 9" W x 7" H x 2 1/2" D. Ruffle is 1" W.
Ribbons, Roses and Rhinestones adorn this sweetheart memory tin. 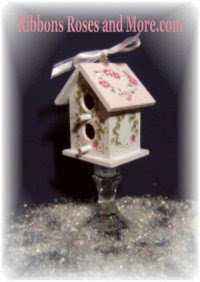 Painted a soft rose petal pink with pink roses, white ribbons and soft sage greenery and a beautiful birdhouse which is a "perfect match" for your Sweetheart on Valentine's Day! Our Sweetheart Glittered Heart Ornaments are Ideal For Valentine's Day & Even Christmas.... Now that Christmas is over it’s time to start thinking about a little romance! Match these ornaments with our Valentine’s Day White Feather Tree featured in Romantic Homes Magazine. Inspired & created by Bethany Lowe. 1 1/2" hearts with wire hangers. Glittered hearts are packaged in a whimsical vintage style box. Set of 8 includes 4 red and 4 pink hearts. Our newest ornament "Passion Pink" has been created especially for the "Sweet Treats" Valentine's Day giveaway at Shabby Cottage Shops! Made with a charming boutique fabric and features several shades of pink flowers and swirls, perfect to celebrate love and romance with your very special sweetheart! Mini Framed Canvas Giclee Print by Debi Coules. Petite in size but oh so sweet! 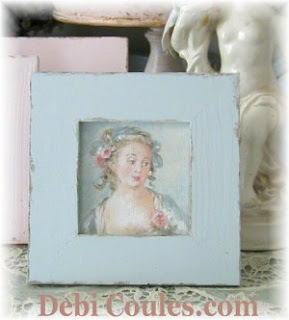 This lovely Framed Mini Print “Claudette" captures the beauty of a lovely French girl from the 18th century. Beautiful roses and ribbons in her hair add to this exquisite painting print. In a hand painted wooden frame, slightly distressed for the look we adore and is signed. Comes ready to hang and also self stands. Measuring 5 inches square. Your kit includes all of the items pictured! 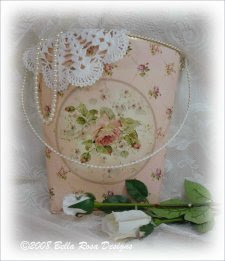 Visit Mimi's Rose Chenille Boutique for more fabulous kits created using Tanya Whelan's Barefoot Roses fabric! Bienvenue and welcome to French Charmed! For your shopping pleasure you will receive a $25.00 Gift Certificate to allow you to personally choose any of our wonderful offerings! 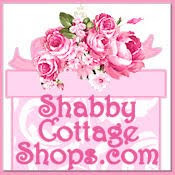 We are a new boutique and will be joining Shabby Cottage Shops very soon! 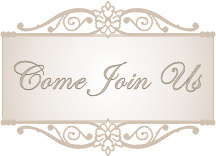 We invite you to come and shop with us! Check back soon and use this $25.00 Gift Certificate during our Grand Opening! 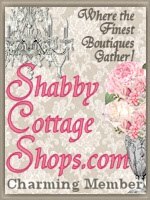 Watch for updated news on our Grand Opening at Shabby Cottage Shops Blog! Enjoy a $50.00 Gift Certificate from Shabby Cottage Shops to be used at any of the shops participating in our "Sweet Treats" giveaway listed here and on our blog! Enjoy and thanks for shopping with us! Happy Valentine's Day from all of us! 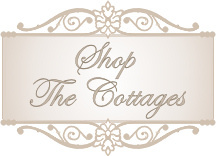 If you love the look of Shabby Chic, Romantic Cottage, French Chic, or Beach Cottage décor, stop by ROSE COTTAGE CHIC for a visit and use this $30.00 Gift Certificate! You’ll find a delightful array of unique hand-painted and repurposed items --- from pretty painted windows, old silver-plate pieces, small furniture, signs, flea market finds, collectibles, and more. Most of the pieces you’ll find are one-of-a-kind and/or original designs by artist, Jill Serrao. Custom orders, special requests, questions, comments, and suggestions are always welcome. 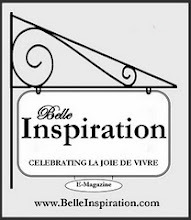 Follow our blog ~ you can do this by looking to the right and scrolling down, you'll see "follow our blog"
All the shops are just wonderful. So many goodies to look at...such eye candy! Wow - what a treasure trove of goodies! I find it so hard to choose a favorite store - there are so many lovely things in each shop. So far I'm down to two: Mimi's Rose Chenille Boutique and French Charmed. Both of so many enchanting choices. Okay. Flipping a coin. Seriously. Mimi's Rose Chenille Boutique is my favorite. I loved browsing through all of the shops! Each has its own unique flavor, and all are delicious! Though it's hard to choose a favorite among such gems, I'm going to say French Charmed because I learned new French words, and for the utter indulgence in our femininity. Thanks! P.S. I accidentally clicked anonymous above. But my name is Tanya R.
Love everything! Such a great giveaway! I find it hard to choose a favorite they're all shabby fabulous! I love this blog.. and I hope I win some of the beautiful things you have to offer.. just beautiful and inspirational.. Gets you in the mood for Saint Valentines Day ! oh my gosh...every shop is my favorite. yeah, it's true, i can't make up my mind when i'm given choices... i'm an "i'll take one of each" kind of gal. lovely things, all of them. This is the biggest and most beautiful giveaway I have seen! Thank you for having it! I found your link at Tristan's blog~ Enchanted Revelry. Everything looks so pretty~This is an amazing giveaway!! OMGoodness!!! Everything being offered is soooo Beautiful! I would love to win! I have become a follower and added a button to my sidebar! Thank you for the opportunity to win! I hope I do! I love that I just found this site! Such cute things to buy!! This is my first blog, thanks for the opportunity to win your great gift! I love Sweetheart's Nest and Dusty Oak Ornaments...my Nana used to make me an ornament every year for Christmas, I'll always cherish those handmade gifts from the heart! My favorite shop so far has to be Nana puddn design. Oh wow, all of these are just so beautiful. It would be so hard to pick my favorite but I am really fond of the Dusty Oak ornaments, those are just gorgeous. Good luck to all who enter. I sure would love to be lucky winner of all of this great stuff. 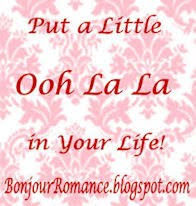 Love all the eye candy on your blog. 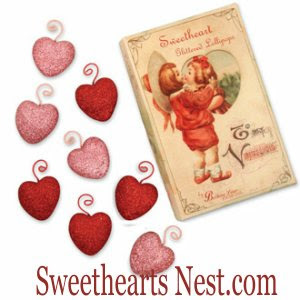 Hard to choose a favorite shop, but I like "Sweethearts Nest"
What a wonderful giveaway! I am thoroughly enchanted with all the shops, but if I have to choose a favorite right now it would be Sweetheart's Nest. I am following this charming blog, and have signed up for the mailing list. Thanks so much for introducing me to such lovely shops! I am a follower and subscribe to your newsletter. 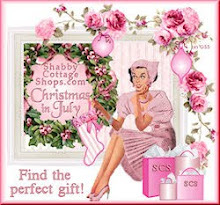 I love your blog and cannot decide on any one shop; I love them all. Such a lovely giveaway. I love ALL your shops! I feel like I'm on a vacation when I browse through all your fabulous items! I especially love the Sweetheart's Nest shop! What a wonderful and generous giveaway! French Charmed is just my style but loved looking at all the shops. 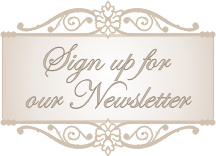 I am looking forward to the newsletters and am now following your blog. Thanks for the chance to win all of these fantastic creations! Amazing giveaway! French Charmed seems to be a favorite, but so many other wonderful goodies in the other shops also. Thanks for the chance to win. What a great treat for the winter doldrums- each item inspired happiness! i hope I win! I love ALL the shops! Just looking at them all is a great pick-me-up! If I HAVE to pick one however, I'm going with French Charmed. Thanks for the opportunity to win! Wow, such lovely things. I am a follower, signed up for the newsletter and I must say as hard as it is to choose a shop I guess French Charmed really called my name. What an amazing giveaway! Well to be honest it is very hard to pick just one its only fair to say they are all so fabulously beautiful. I love each and every one of them they all have atleast one or two beautiful things that can be purchased. So with saying that I love them all there to many talented individuals to say you like anothers shop. Thank you so much for having such beautiful shops and making our homes that much more beautiful. This is such a fantastic giveaway! It is so hard for me to pick a favorite because I love all of these shops. I guess if I had to pick a favorite it would be Bella Lucille. I would love to win this beautiful collection of goodies. What a great giveaway. Found you after you after you connected with me on Free Bloggers Network. Thank you for the invite. I am now following your blog and I really like the Debi Coules picture frame. I chose her because I am a big fan of the French Country look. Thank you for the opportunity to win such a great prize. My favorite shop has to be Sweetheart's Nest! I am a follower! Beautiful site!! What a grand assortment of beautiful items. I'd love to be entered in your draw. Thanks for the chance to win something so wonderful. I follow you on Google Friends Connect - Carolsue E.
I subscribe to your Newsletter via e-mail - Carolsue E.